What if I told you there were simple little things you could do that would end up doubling your revenues and profits? Sound to good to be true? As a big picture, doubling your business does seem like a massive task. But author Pete Williams breaks the process down into seven things you need to focus on, then look for small 10% wins. Much like compounding interest, the cumulative effect of making small improvements in numerous areas of your business can quickly have a massive impact. In this interview, Pete shares numerous examples across various industries that illustrate some of the ways you can use his Seven Levers to grow your business. 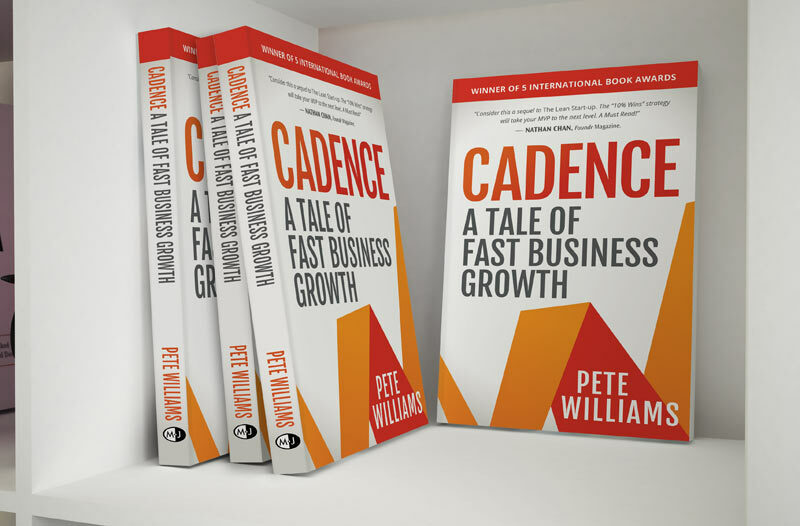 And it’s all captured in his new book, Cadence, which serves as a guidebook for you to figure out how to find the Seven Levers for your business, and how to find the 10% wins in each of them! It’s a quick easy read, and at the bottom you’ll find a link for a FREE audiobook version when you buy the hard cover (but only for a limited time after this interview goes live!). 01:40 – What’s the Cadence book all about? 05:50 – Why should we trust Pete’s advice? 11:35 – What are the 7 levers to grow your business? 17:40 – Measuring small wins to get massive gains. 23:20 – Does it work better in some industries? 24:45 – How long does this take to work? 30:15 – Which lever should you start with first? 33:15 – Which lever has the most impact? 34:50 – Using the levers as a filter to focus on the best things. 39:40 – How Pete uses the 7 levers to drive book sales. 45:25 – Where to people struggle to implement the 7 levers? Suspects – People who are just looking. Prospects – People who are serious about buying from you. Conversions – The percentage of prospects that end up buying. Average Item Price – How much do you charge per item sold? Average Products per Transaction – How many things do you sell per transaction? Transactions per Customer – How often do they come back and buy again? Profit Margin – How much do you make per item sold? Keep in mind, Pete recommends that the first step is simply identifying what these seven levers are for your business. Then, the key is thinking about how you can grow each of those seven things. Where the real strategy comes into play is figuring out which ones are the low hanging fruit and starting there (usually it’s just looking for ways you can cut costs and plug leaks), then figuring out which ones will have the most impact. The reason why this works is because, psychologically, it seems attainable. If you grew each lever by 10%, the compounding effect is that you end up doubling your total revenue. But if you just say “I need to double my customer base” or “I need to double my profits”, those grand aspirations are rarely achievable on their own because they’re just too big and too abstract to solve. The other thing I like about it is that putting a number on it, in this case 10%, it creates a concrete figure to shoot for rather than just saying, “Well, I think we need to increase foot traffic through our store.” Create a set of metrics, then measure against them. One of the tips I like is to focus on growing sales from your existing customers, which can often be easier than finding new customers. Not only can this be one of the easiest levers to grow, but also one with the most impact. If it all seems overwhelming, then start with one. Pick an easy one. Some of Pete’s examples show that something as small as putting a sign up can make a big difference. So just start. Create a plan, hold yourself to it (discipline is key to success…set a time and day each week or month to work ON your business), and start. Then next month, figure out how to improve one of the other levers. And just because you get a 10% win on one lever doesn’t mean you can’t keep working to get another 10% win on that same lever. The bonus material is at the end, and it’s every bit as important as the rest. Pete recommends using your seven levers as a filter through which to view opportunities and efforts. Just because something seems like a good idea, if you can’t see how it very clearly grows a lever, then it’s probably not worth doing. When we start talking about how Pete is using the 7 levers to sell his book, he brings up a really interesting tactic. Obviously, not everyone will buy it directly from him, which makes it tough to capture email addresses and create opportunities for repeat customers. So, he put calls to action inside the book, offering worksheets and other downloads that require an email address to access. It’s a simple workaround. How can you overcome little obstacles like this in your own business? One of the last bits of advice Pete gives is to have a plan, ideally one that’s structured. Without sounding like we’re just plugging his book, it offers a clear guide to creating a plan that fits your business. Whether you choose it, something else, or create your own, having a plan is much like having a metric to measure against. This is how we “get out from under the hood” and start working on our own businesses. Win a Copy of Cadence! Leave a rating and review of The Build Cycle Podcast on Apple Podcasts, then email me your profile name so I can verify and reach out to you. Two reviewers will win a book this way. Follow The Build Cycle on Facebook and Twitter, then Like and Share/Retweet the post about this podcast. I’ll pick one person from each social network and send you each a copy of the book. Enter both ways if you like, but make sure to do it by September 10th…I’ll pick the winners shortly after that!